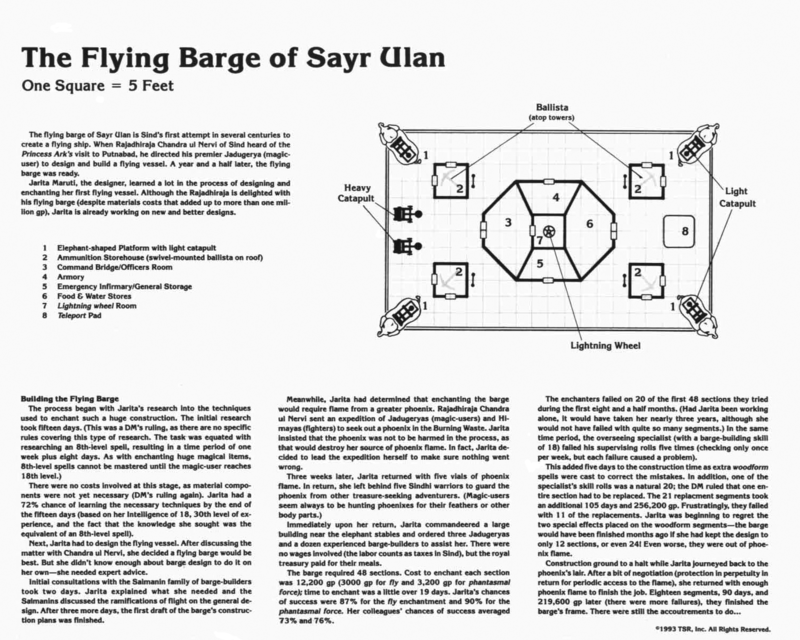 Initially I was going to turn the Flying Barge of Sayr Ulan into an Arabian-themed spelljamming vessel inspired by flying carpets, but when I remembered a post on The Piazza about Indian Vimanas, I realized it would work much better in that context. Description: The Vimana is a groundling human design from lands of jungles, elephants, and ruling Rajahs. While its essentially barge-like construction would allow it to carry a substantial amount of cargo, the ship is primarily used by the aristocracy to travel in style, or to have a grand command platform during war. A small number house flying shrines to the deities worshiped in these lands, while fewer still serve as ships of exploration. Trade is typically carried out by less ostentatious ships. Vimanas consist of a thick, strong wooden base made of layered and interlocking panels; the density of the panels pull the gravity plane into line with the base so long as the structures above aren’t more than 20 feet tall. Taller structures completely unbalance the craft, however. Because of this base, these vessels can only land on very flat surfaces; typically landing sites are specially designed for the ship. 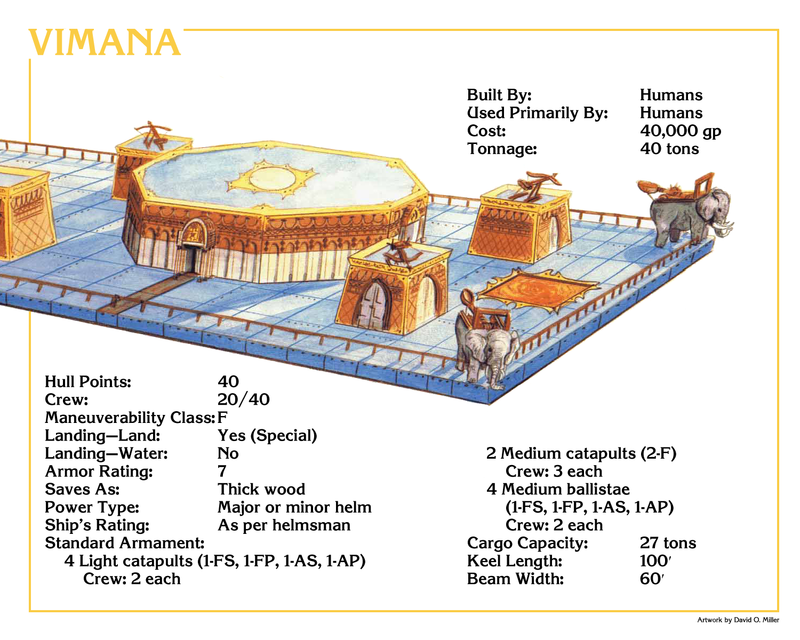 Any attempt to land on rough terrain forces the ship to make a saving throw versus crushing blow or the landing is treated as a ramming attack by a vessel of the same size as the Vimana. Built onto the hull is a central structure for the helm and crew quarters; while this structure is usually only one floor, some have larger structures, consisting of no more than two or three floors. Outside of this central structure are smaller structures for fixed and turreted weaponry; often the ship’s corners are adorned with catapults built onto platforms resembling elephants, tigers, or other animals. While everything is made of wood, they are all richly painted and decorated. As many of these vessels are unique, the interior of the central structure should be altered to suit the campaign. The Ammunition Storehouse (2) should be used for crew and weaponeer quarters. Ignore the Teleport Pad and Lightning Wheel.